Dôvera, the biggest private health insurance company in Slovakia, has been fighting diabetes long term. The disease affects the lives of more than 400 000 Slovaks and 85% of the treatment is in hands of the patients themselves. If not treated well, the disease may have fatal consequences. So we created a web app for Dôvera that helps medical specialists and educators communicate easier, treat diabetes more effectively and educate their patients. How to improve collaboration between diabetes related professionals to treat and educate their patients. 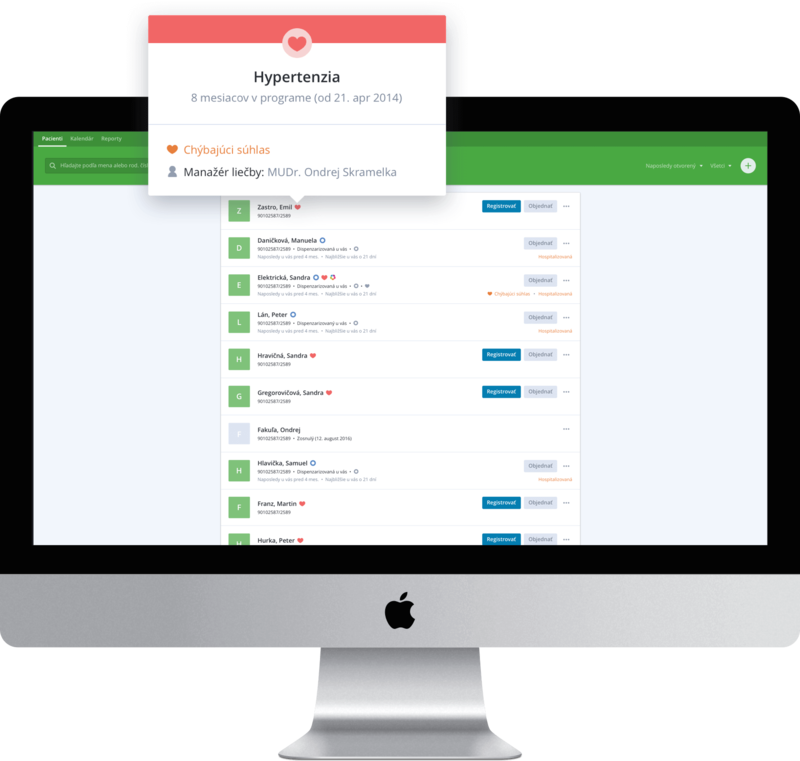 User-friendly web app that allows diabetologists, medical specialists and professional educators to collaborate better and share information about their patients. Patient details with recommended activities, history of examinations and measured sugar values. Diabetes is an incurable disease, but when following an appropriate lifestyle under medical supervision, its symptoms can remain relatively subdued. It is therefore crucial that patients are led to a lifestyle adapted to the disease. This requires active attention not only for diabetologists, but also for professional educators and other medical specialists. Sometimes there can even be six professionals taking care of one patient. All these experts need the most up-to-date information on their patients' condition and results. In the absence of any centralized system, however, it was very difficult. That’s why the health insurance company Dôvera asked us to design an application that would help them communicate with each other. We have designed a web application based on users’ behaviour that allows physicians, specialists and educators to document and share health information about their patients in a centralized digital database. All of that in a very user-friendly and transparent form. We launched the project with an intensive research. We visited several general practitioners and spent hours with them to understand their specific needs. For instance, we learned that medical professionals lacked a simple summary of patient’s history to quickly figure out when the next appointment should be booked with the patient. We used this insight and many others to design the concept and first prototype that we immediately took back into doctors' offices to test. Although we solved many of their issues, they still had troubles with accessibility caused mainly by their greater age. The problem was often caused by their old devices, especially monitors, that did not always portray our design as proposed. Therefore, we iterated the whole interface to more contrasting design, with more distinctive fonts and icons. The app helps doctors and educators not just with collaborating, but also with picking the right treatment approach. After a new patient is assigned, the app will automatically propose the appropriate pre-programmed treatment plan based on the latest evidence-based medicine. Each doctor can accept, deny or adjust this plan according to any patient’s individual circumstances. The application had a great impact on the work of professional educators and doctors who use it as a primary tool. In the initial phase, 40 professionals and 3,268 patients were involved in the project, of which 832 successfully completed the whole cycle of 8 group educations. In addition, the application is also beneficial for DôveraPomáha project, where it makes it easier to book exact dates for appointments. In the pilot version it can now be used in 180 medical facilities. However, the solution we have proposed is not limited only to treating diabetes. Thanks to the modular components and a living style guide, in the future it can be easily extended to basically any other electronic service that Dôvera would like to offer to its patients. Interested in a free consultation? Get in touch or visit us in our office in the centre of Bratislava, Slovakia. Our freshly brewed arabica is waiting for you! Sign up for our rare but crispy newsletter and learn more about user centered design.